2018 was another big year for SAFE’s Community Outreach Program. The Outreach Program enables us to extend services to horse owners who need short term assistance to get through tough times. Whether it’s hay, vet care, gelding surgery, or even just advice, our Community Outreach volunteers work to find a solution that allows horses to stay with their owners and stay out of rescue. The Outreach Program was headed up this year by SAFE volunteer Nicole B. Nicole took over Outreach last spring when the previous Outreach Manager stepped down suddenly for personal reasons. Despite being in school and starting a business, Nicole found the time to help people through this pivotal role. She says the part she enjoys the most about Outreach is talking to people and helping them through times of trouble. 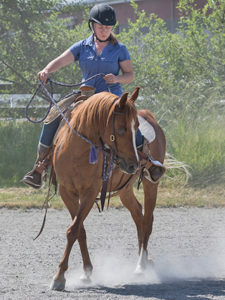 With her vast experience in this area, Nicole was really able to have a significant impact on horses and their owners. Nicole has decided to take a break from Outreach while she finishes school, and we are so grateful to her for the kindness and attention she has brought to the role. Thank you, Nicole! 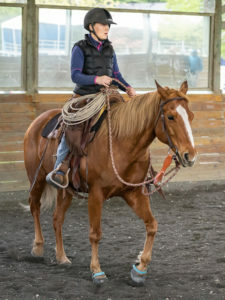 Stepping in to lead Outreach is Kelly F, another long time SAFE volunteer who decided to expand her involvement with SAFE beyond being hands‐on at the barn. Welcome, Kelly! As you may well imagine, SAFE receives a lot of communication from people needing help with their horses. To give you an idea of the demand, we estimate that in 2018, we received 250 emails and more than 150 phone calls from horse owners seeking assistance. We were also involved in an unusual rescue mission early in the year involving 21 neglected and abandoned horses living together in a herd on a foreclosed property. Dubbed the Mayday Horses, SAFE was able to remove this herd within the deadline set by the property owner, and while 4 of the Mayday horses had to be euthanized, the rest were successfully placed into new homes. This type of emergency herd dispersal does not follow our normal model for rescue, but it was necessary to take a different approach in this situation. SAFE funded veterinary care for all of the Mayday horses, so that all stallions were gelded, and all horses received the care they had been without for so many years. In total, we spent nearly $13,000 on this project, and took three of the horses into our rescue program, two of which were pregnant mares. The Mayday project was headed up by Terry Phelps, who did an extraordinary job to save these horses. Thank you, Terry, for putting your heart and mind into overcoming what seemed impossible at first. Really stellar work! We also received a tremendous amount of local support during this rescue,people who stepped in not only to take the horses and spread the word but also to help catch and transport them. We ended up taking in seven horses as owner surrenders in 2018. While intake is not the preferred outcome for our Outreach program, we are often called upon to help horse owners in truly desperate situations. If we feel that a horse is at risk of being neglected due to its owners circumstances, AND we have a space available here at SAFE (meaning we have less than 30 horses in our care), then we will allow the owner to surrender the horse to us. We then take on all responsibility and all costs associated with rehabilitation, retraining, and rehoming that horse. 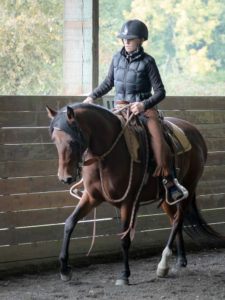 We also provide that horse with an ongoing support system in case of future issues. Another accomplishment in 2018 that we are extremely proud of was our Blanket Bank, through which more than 80 waterproof horse sheets and blankets were distributed free of charge to horse owners in need. The majority of these blankets were donated to SAFE and we partnered with Blanket Express Equine Laundry for washing and waterproofing, but we still ended up spending close to $2,000 prepping blankets for distribution. Major thanks go to SAFE staff member Kit Topaz for the tremendous amount of time, energy, and heart that she devoted to making this project an overwhelming success. Our program is made strong by the volunteers and staff members who devote their time and energy to it. One of the challenges with the Community Outreach Program is that the majority of the work is done behind the scenes, especially since we have a policy of protecting the identity of the people we help. But the work is so important, and it’s vital that this not be a thankless job. So a heartfelt thank you to Nicole, Terry, Melinda, Jeannette, Kyle, Kelline, Shar, Candace, Casey, and Jolene for all that you did to help people and their horses. We’d also like to thank Dr. Hannah Mueller and Cedarbrook Vet Care for providing triage, quarantine, and vet care for our Outreach Program.